But this is not to say that nothing would be lost. To the contrary, we would lose a great deal. In particular, we would lose something about art and its role in public life. We would lose the tangible, official, institutional evidence that the society represented by the United States government is one concerned not merely with commerce and power but with ideas and values. In 2017, after decades of shrinking resources (despite some improvement during the Obama years), the NEA and the NEH were already working with limited means: capital resources of less than $300 million, combined. Both organizations employ strategies to maximize their investments through matching-grant initiatives, serving as stimulants to state-level investment, foundational support, and private donations. Since the days of Jesse Helms, the National Endowment for the Arts no longer endows any individual artists, but it still provides funding to state and regional organizations for them to dispense in accordance with their varied missions. 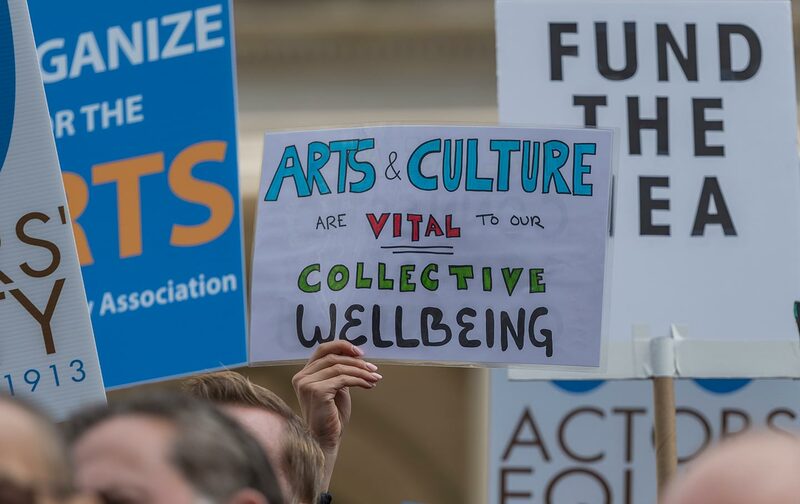 Functioning this way, the NEA manages to accomplish quite a bit of sizable benefit, particularly to artists functioning outside the commercial sphere. It is a principle source of support, if not the only source, for projects promoting folk arts, preserving historical traditions, and providing arts education in rural and low-income communities all over the country. The NEA has made regional arts projects such as the East Valley Children’s Theater in Mesa, Arizona, which brings young people together to create stage works for other kids. More visibly, it has been the primary support system for the Poetry Out-Loud Competition, which hundreds of thousands of young people from all 50 states participate in annually. At the same time, the NEA provides essential funding for quite a few high-profile arts ventures, including the American Film Institute, the Spoleto Festival USA, and the Sundance Film Festival. And it was behind the Vietnam Veterans Memorial and Hamilton, when it was still the experimental, untested Hamilton Mixtape and very much in need of financial backing. For those reasons, the collapse of the NEA would have nuts-and-bolts consequences, undermining or undoing hundreds of existing programs around the country and threatening many others that have yet to come to fruition. The value of the NEA, and of the NEH, therefore is not only symbolic. Nor is the power of it anything to dismiss as “mere.” The endowments stand, in the Trump era, as potent reminders of the importance of the public realm, a place where many things, including artworks, can and should be made, preserved, or shared for reasons other than profit. The quote is worth rereading, not only for its message, but for the reminder of something almost inconceivable today: that there used to be presidents who thought and talked that way.